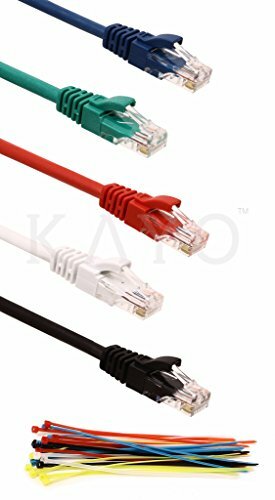 Ethernet Patch Cables by KAYO Pack of 5 High performance Cat5e, UTP, 24 AWG, OD5.2mm, RJ45 Ethernet Patch Cables, plus cable ties. High Performance Cat5e, 24 AWG, UL Listed, RJ45 Ethernet Patch Cable provides universal connectivity for LAN network components such as PCs, computer servers, printers, routers, switch boxes, network media players, NAS, VoIP phones, PoE devices, and more. Comes with 5-pack Cat5e Ethernet cables in Black, Blue,Green, Red and White. Build your home or office network with Gigabit Ethernet; A wired Cat 5e network is more reliable and secure than a wireless network for your internet connections.Meets or exceeds Category 5e performance in compliance with the TIA/EIA 568-B standard. If you have any questions about this product by KAYO, contact us by completing and submitting the form below. If you are looking for a specif part number, please include it with your message.